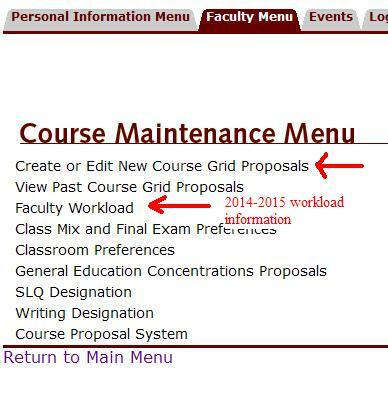 The Grid and Two-Year Workload applications in Garnet Gateway allow department/program chairs to plan course offerings for the next two academic years and to submit these plans to the CCC and/or Dean of Faculty’s office for approval. Each January, chairs submit a fall, winter, and short term grid for the next academic year to the CCC. So, right now the grids would be for fall 13, winter 14 and short term 14. Each January-February, chairs submit Workload plans (courses without times) to the Dean of Faculty’s office for the next two academic years. In the Workload application, there is a tab for the next academic year and a tab for the year after that (see below). So, right now the two tabs are for 2013-2014 and 2014-2015. Click on the academic year label to toggle between the tabs. The tricky aspect is that since the 2013-2014 workload for your department/program was submitted last year at this time (as part of the 12-13, 13-14 Two-Year Workloads) there is already data in the Workload application for 2013-2014. In order to save you time in completing the grids, this information was fed into the fall 13, winter 14, short term 14 grids to prepopulate them. As you now work on refining the 2013-2014 grids, that information will automatically flow back to the 2013-2014 tab in Workload. You can also edit 2013-2014 parameters not collected in the grid such as teaching credits. For the Two-Year Workloads all that needs to be done now is enter 2014-2015 workloads and edit 2013-2014 non-grid information as needed.